Susan is a CNVC Certified Trainer, private consultant and speaker. As an Assistant Dean at UCLA in the early 70s, she co-created and taught the Women’s Studies Program. Since 1976 she has conducted training in a variety of self-development areas. A graduate of Bryn Mawr College, Yale University and Pacifica Graduate Institute, Susan has masters’ degrees in Psychology and Russian / East European Studies. She has had a private consulting practice for more than 20 years. 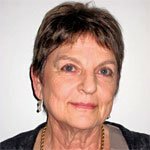 A founder of the NVC Training Institute, Susan has given NVC training in the USA, Canada, Europe and Korea, and has been a regular trainer at the Center for Nonviolent Communication's (CNVC) International Intensive Trainings (IIT). She has worked with General Motors and the government of British Columbia, among others. She served as the CNVC Registration Coordinator for Certification Candidates in North and South America for almost 10 years.